It’s unclear what exactly this means. 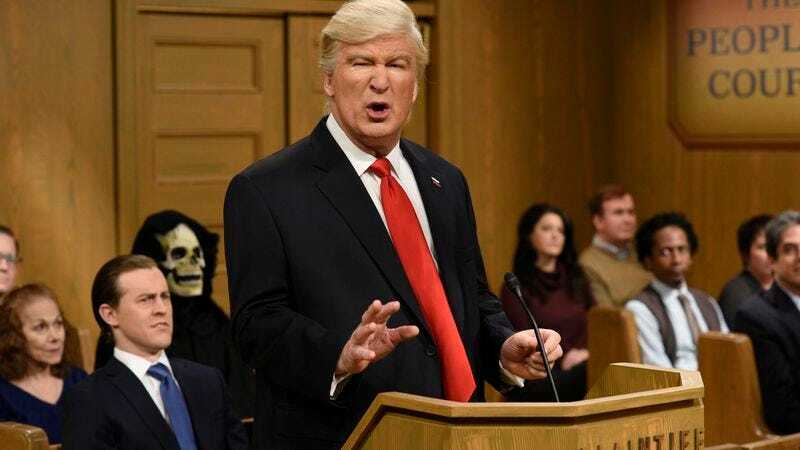 Baldwin’s reign as Saturday Night Live’s Trump has always seemed tenuous, given that he’s not a regular cast member. Will he be dialing back his take, or handing off the gig to someone else? Regardless, it’s hard to imagine that SNL would stop making fun of the president altogether. The show has always done that even when the situation wasn’t this, well, extreme. Also, Baldwin continues to align himself more closely with the impression: He’s even co-writing a fake memoir for the outraged orange leader titled You Can’t Spell America Without Me: The Really Tremendous Inside Story Of My Fantastic First Year As President Donald J. Trump.